After more than 400,000 people took to the streets in New York City three years ago, the Peoples Climate March is returning on April 29 in Washington, DC. With an administration in power that consistently fights for the fossil-fuel industry at the expense of the planet’s resources, a GOP-controlled Congress filled with lawmakers who deny climate change exists, and with each year breaking global-temperature records, the stakes are higher than ever. More than 800 organizations have endorsed this year’s March for Climate, Jobs, and Justice, and organizers hope to bring out hundreds of thousands of people to the march in DC and sister marches across the country. And this time around, the march will come after a week of action beginning with the March for Science. The action doesn’t begin on April 29. The “Week of Action” starts with the March for Science on April 22, a demonstration for science funding and accessibility happening in nearly 500 communities around the world. It continues with a live-stream teach-in on climate science on Monday, April 24, the launch of a bill requiring 100 percent clean energy by 2050, and, for those who can make it to DC, a visit to the DC city council on April 28 to demand local action to fight climate change. And if you’re still in DC after the march, you can attend a training on April 30 to become a “people’s climate candidate” that will push progressive policies and defend the environment. Finally, to cap off the week, organizers are encouraging participants to stand in solidarity with workers, immigrants, and activists on May 1, May Day. You can find all of the “Week of Action” events here. 2. Join the march in DC. To join the march, head to the front of the Capitol Building that morning. Line-ups will start at 11:00 ᴀᴍ, and the march will officially begin at 12:30 ᴘᴍ and continue until 5:00 ᴘᴍ. If you want to get involved more deeply, you can volunteer to act as a marshal. If you’re traveling from outside the capital, you can find a bus heading to the protest here. Unable to make it to Washington, DC? There are hundreds of marches planned on the same day across the US in cities such as Los Angeles, Houston, New York, Cincinnati, and around the world in cities ranging from São Paulo, Brazil, to Kilifi, Kenya. You can find more information on these protests here. Whether or not there’s a march planned in your area, organize in your community. Talk with community groups, political organizations, and your neighbors about putting together local events or otherwise lobbying your representatives to fight for just climate policies. 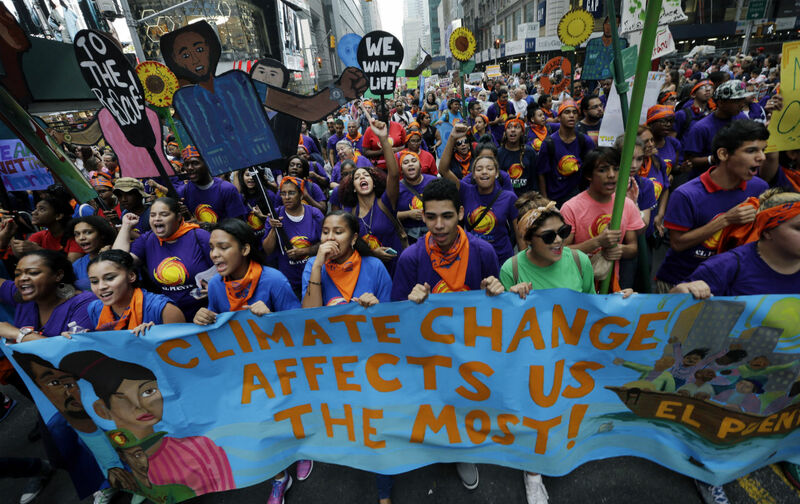 Check out the Peoples Climate Movement’s organizing tool kit to help you get started. Their political-action tool kit on how to take advantage of town halls to fight for climate justice is especially useful. You can find town halls or other opportunities to meet with your representatives here and here. Wherever you are on April 29, it’s a great time to shout from the rooftops. On social media, bring attention to the march and its goals using the hashtag #ClimateMarch.